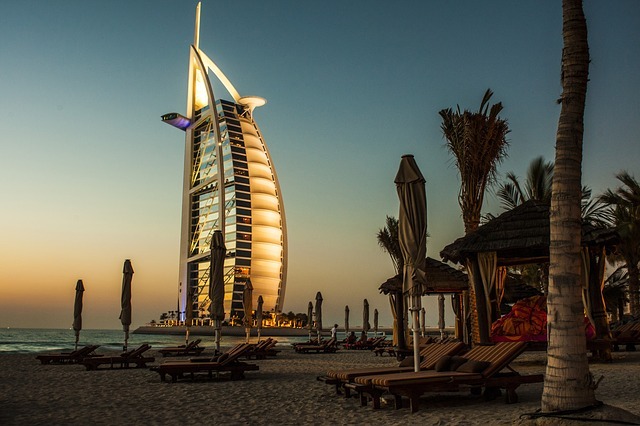 No matter if you’re a resident or just visiting, the Oasis city of Dubai offers some of the coolest attractions that are on a par with any city in the world. Dubai is not only home to spectacular attractions but has also transformed its skyline with startling architectural projects. If you ever want to soar like an eagle, visit the Burj Khalifa, the world’s tallest building. From the stunning Palm trilogy to the Dubai Mall and Dubai Marina, you’ll surely be mesmerized when you visit the attractions in Dubai. Here’s some of our favorites. Truly a sight to behold, the world’s tallest building is a must-see attraction for anyone visiting this city. A visit to the tower last around 90 minutes, during which you’ll be whizzed up to the observation deck for some magnificent views of the city and the stunning desert that lies beyond. Also don’t forget to sip a cafe latte from one of the many coffee shops that line the deck at Dubai Mall, which sits right opposite the Burj Khalifa. This, the world’s largest indoor ski resort, is part of the enormous Mall of the Emirates, encompassing a whopping 22,500 square meters in total. The Indoor Ski Park opened back in 2005, and the best feature is a 60-meter tall mountain that offers five different slopes for skiers to try. One of them is the world’s first and only indoor black run, a testy challenge for even the most experienced of outdoor skiers. There’s also a Snow Park next door that offers a chance to make snowmen, run the toboggan and more. Opening this year, the Dubai Eye is set to become the world’s biggest Ferris Wheel and yet another amazing attraction in the city. It’s part of a brand new tourist complex that’s currently under development, and once finished the 201 meter tall Dubai Eye will surpass even the Singapore Flyer, which stands at 165 meters and is the current tallest Ferris Wheel in the world. Last year the Dubai Miracle Garden opened its doors for the first time. It proudly boasts of being the world’s biggest natural flower garden, and is home to more than 45 million flowers across its 72,000 square meter gardens. As well as regular flower beds, there are some spectacular arrangements in the form of topiary-style displays shaped into stars, hearts, pyramids and many other shapes. The floral displays change regularly according to the season, so repeat visitors are sure to see something new. Last but not least, Dubai’s Water Discus Hotel offers a sleeping experience like no other – under the ocean, quite literally. The rooms all offer windows that open directly into the ocean depths, which means you can enjoy stunning views of the aquatic life beneath the waves. There are 21 suites in total, so be sure to book early!